GO GREEN WITH THE #1 ORLANDO TREE REMOVAL & TRIMMING SERVICE! Orlando is a lush area full of diverse plant life and trees. Since 2003 Advance Tree Pros has dedicated itself to being the most dependable and green tree care service. Our commitment is not only to the aesthetic appeal of your property but also to the health of the trees on your land. Healthy trees are a boon to the local ecology, they not only look better but they create oxygen, provide shade, and become habitat for local animals. Caring for your trees is creating a better world for all of us! Advance Tree Pros is dedicated to keeping Orlando beautiful and to us, beautiful means green. Trees improve our air quality, generate higher property values, provide energy savings and make Orlando a cooler place to live. We aren’t just an Orlando green tree care service Company, Orlando is our home too! Hire Us and the Planet Will Thank You. Reducing your carbon footprint is the goal of many individuals, especially in large cities like Orlando. Hiring Green Tree Care Services might not seem like the most green of choices but it really is better for the environment that many trees, shrubs, and bushes are pruned by professionals on a regular basis. We understand that you want to protect your property and the flora that grows on it in the most ecologically friendly way possible. Our professionals are trained in the care and nurturing of the trees found in and around Orlando, we even have several ISA certified Arborists on staff to best advise on how to proceed with each job we do. We employ the best practices to maintain and preserve the environment. 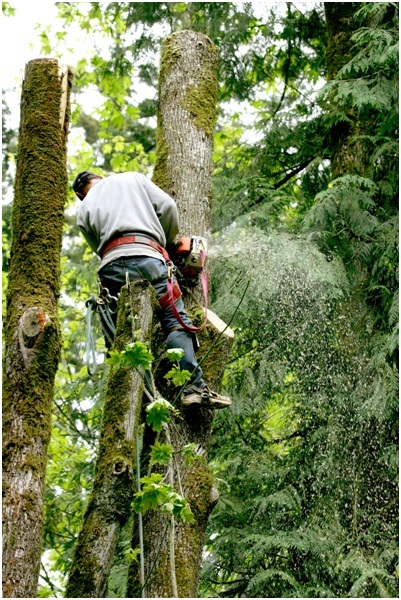 Our crews have extensive training, skills, and equipment to handle any kind of green tree care service, from removing diseased branches, to tree stump removal, to reshaping old growth of massive trees. We can even plant trees to replace what we remove! A surprising amount of debris results from even the smallest of jobs. We, as the #1 Orlando tree removal and trimming experts, believe that you should NEVER have to worry about this mess, nor should you ever be concerned that you’re contributing to the problems of our environment. No matter which Orlando green tree care service you need, we make sure that everything is cleaned up before we leave… but what do we do with all of that debris? Where does it all go, since our county landfills are being inundated and filled to the brim? After all, we want to be part of the solution, not part of the problem. We produce about 50,000 cubic yards of mulch a year. If you were to stack that in normal sized bags that mulch usually comes in, it would reach 18 miles into the sky! That’s a WHOLE LOT of mulch that is NOT adding to our landfills. That is a lot of nutrients not being wasted and creating methane in a landfill. The nutrients from the mulch are being put back into Orlando soil, helping to fight weeds and create more lush and healthy tree growth. If you need tree cutting in Orlando, you should be able to take pride in the fact that your tree cutting professionals care for your property as much as you do. We take immense pride in our green practices. Our experts are continually educating themselves on the latest eco-friendly practices in the industry. Our professionals work to ensure that each property we visit is left cleaner and healthier than it was when we arrived. We will work with you to preserve and encourage the growth of the trees on your property. We don’t leave yard waste from our work to stagnate in a landfill or to end up polluting our lakes and water supplies. 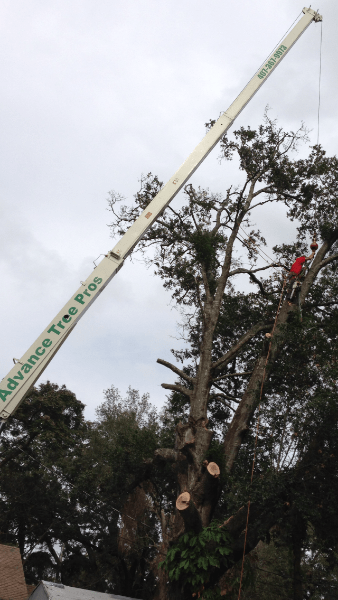 Advance Tree Pros is so committed to the greening of Orlando that we promise to never raise our prices after a storm. We know that storm clean up is a necessary and vital part of preserving the environment in which we all live. We work quickly and diligently at every job to ensure the trees are cared for to the best of our ability and we leave no mess behind. We will diagnose diseased trees and treat them for pests and plagues. We are greening up Orlando with every job that we complete. Having an ecologically friendly business is our passion at Advance Tree Pros and we want to be as green as possible for the betterment of not just our customers but for all of Orlando. Let us help you green up your property by caring for your trees! Orlando is a lush area full of diverse plant life and trees. 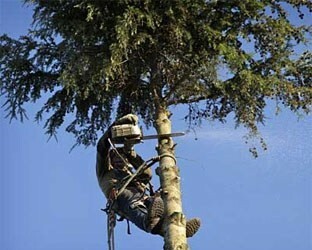 Since 2003 Advance Tree Pros has dedicated itself to being the most dependable and green tree cutting service. Our commitment is not only to the aesthetic appeal of your property but also to the health of the trees on your land.